When the ‘Iron Curtain’ fell across Europe in the late 1940s, the Danube became a river divided. Its infant waters flowed through democratic West Germany and Austria, yet this mighty waterway also coursed through Soviet satellite states Czechoslovakia, Hungary, Romania, Bulgaria, Moldova and Ukraine, along with the independent but communist-run Yugoslavia. In those latter countries, opposition to (and even criticism of) repressive regimes had to be conducted strictly out of sight, and this clandestine resistance is thought to have given rise to secret bars in Danubian cities like Bratislava, Budapest and Belgrade. Some of these quasi-legal drinking dens still operate, now of course imbued with the extraordinary cool of their historical associations and way-off-the-beaten-track locations. You’ll find such speakeasy-like bars hidden away in apartment blocks, behind shops and even in churches – but only if you know where to look! Take Belgrade’s World Travellers’ Club (also known as the Federal Association of Globetrotters), a gloriously bohemian haunt in the basement of a residential building on Bulevar Despota Stefan. This was once a meeting place for opponents of Slobodan Milosevic and a popular party spot during the Balkan conflict of the 1990s. Its name is deliberately ironic – embargoes prevented Serbs travelling abroad at the time – but took on a new meaning as an influx of foreign visitors promoted cultural exchange and contributed knick-knacks from all points of the compass – knick-knacks that now comprise the bar’s eclectic décor. Tijuana is even harder to find, on the second floor of a common building at the corner of Prizremska and Sremska, with no indication at street level of its existence. And indeed, inside it simply appears to be a two-room apartment with a bar in place of the kitchen and walls decorated with marker pen graffiti (which visitors are encouraged to contribute). Generously measured drinks reinforce the feel of a gatecrashed house party. Bratislava’s Michalska Cocktail Room, accessed through a Narnia-like set of cupboard doors, is one of the city’s hidden treasures. Though it is located on the top floor (above Urban Bistro on Michalska street), this bar has a distinctly underground ambience, with bare brick walls and Deco furnishings specifically designed to evoke a 1930s speakeasy. Cocktails utilise fresh local ingredients and gradually change with the seasons – the extraordinary drinks menu is packed with lesser-known gems and signature versions of worldwide favourites collected by the owner on his travels. The sheer entrepreneurialism of transforming the most unassuming (often downright dilapidated) buildings into countercultural bars and clubs is embodied in the ‘ruin pubs’ (romkocsmák) of Budapest. The authorities made countless attempts to close them down in the 1990s, but found that, like hydra heads, they simply reappeared a day or two later, in a different location but with the same clientele, keen to drink, smoke and talk politics. 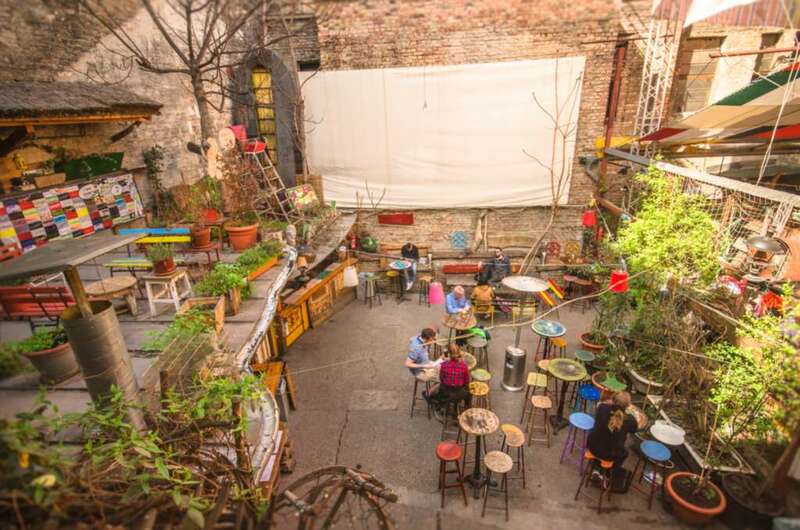 Szimpla Kert (on Kazinzcy, in the heart of the Jewish Quarter) is the first and most famous. This warren of grubby, grungy rooms is packed with art installations and deliberately mismatched bric-a-brac, from road signs to a derelict Trabant car. Its courtyard plays host to live bands, film screenings and even a farmers’ market (on a Sunday morning). Szimpla Kert has firmly established itself on the tourist drinking map in the last few years and evening queues are common, so head here in the afternoon if you want to avoid the crowds. Thirstier travellers might note that Budapest boasts enough ruin pubs to comprise a ‘crawl’. Bistro-style Most (Zichy Jeno), for example, is best for brunch, to the accompaniment of ice-cold mimosas; achingly stylish Mazel Tov (Akacfa street) sustains you with falafel and succulent grilled meats as you work your way through an intimidating menu of palinka shots; and Instant (Nagymezo street) is the largest, with 26 rooms, where the party goes on until dawn. 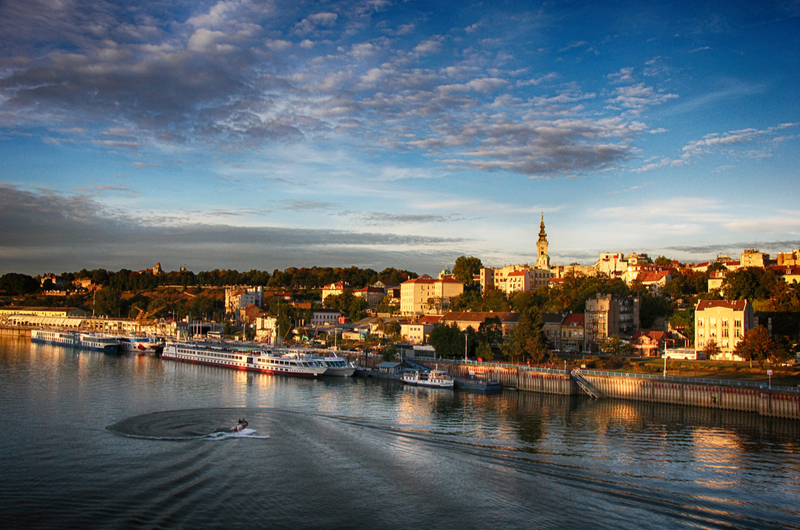 So if do you raise a glass with the locals in a secret bar or ruin pub on your next Danube cruise, cheers! (Or živeli! in Serbian, na zdravie! in Slovak, or egészségedre! in Hungarian).